" SYN: THE SENSORY EXPERIENCE "
Synesthesia is a neurological condition in which one sense or part of the body produce sense impressions by stimulating another sense. These perceptions are varied for each individual. It is a neural diversity and by that brain creates its own perceptual reality. Approximately 4 percent of the entire population born with synesthesia. Almost 80 different types of sensory perceptions appear on synesthetes which are unlearned and unintended. For synesthetes, numbers and letters can have personalities and colours, while sounds and shapes have their own taste. Song December Blue might not be blue at all because month December might be crimson red. But, for someone else, the song is mostly emerald green because there is a high density of the note F (Fa). The aim of the "Syn: The Sensory Experience" is to transfer the sensory perception of this phenomena through multi-sensory experiences accompanying with auditory, visual, tactile and olfactory stimulation.Visitors experience this unique condition as putting themselves in synesthete's shoes and walking through the screening pathway. Design outcomes in the form of visual and light mapping are coming from the collection of data from synesthete participants which are obtained through observational and analytic research sessions. Consequently, this exhibition will only reflect the accurate sensory stimulation of the participants. It will allow visitors to witness someone's perceptual truth. In some cases, synesthesia doesn't appear as a pleasant experience. What if you have to travel the London Underground by tasting it. Would you be pleased to take the Victoria Line which tastes like candle wax or District line with a taste of a fatty lamb dish? What if you have to change your job because you can't tolerate the taste of your colleague's name. Or you don't want to hear about your best friend's partner because her name tastes like sick. Concept development originated after "dreamscaping" process. Subconscious wishes on listening music of the participants turned into a concept headphones. 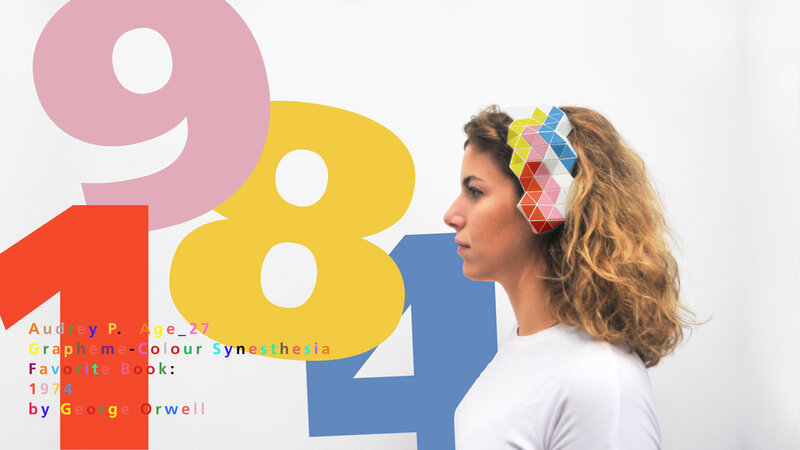 The initial idea was to create a colour-changing headphone which switches colour through synesthete's colour perceptions and generates holographic visuals. 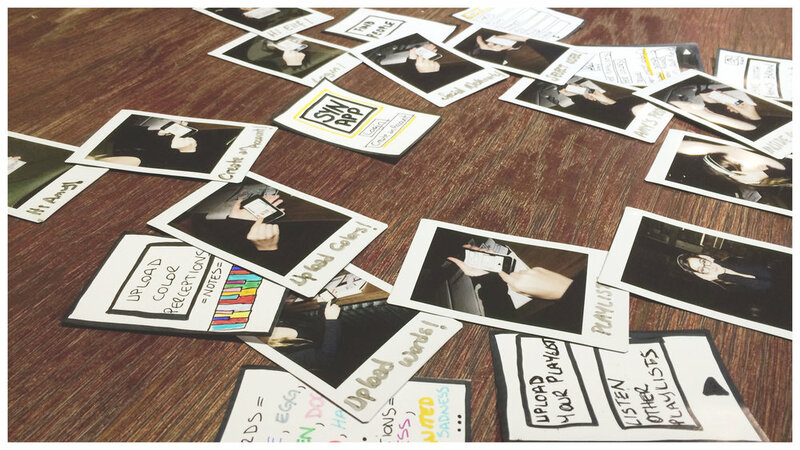 Agile prototyping was used to create props for scenario generation and to perform design improvisation sessions with various people. Initial concept had a statement headpiece as a headset. Later, more subtle origami design was created to assosiate it with synesthesia experience concept.